6 November 2014 – The United Nations envoy for Lebanon said today that the vote in Lebanon’s Parliament yesterday to extend its mandate until 2017 had spared the country a “further serious vacuum,” but, regretfully, elections had been postponed again amid mounting political insecurity. “This has spared Lebanon a further serious vacuum in the institutions of the State but it is a matter of regret that Lebanon, with its strong democratic tradition, remains unable to hold the parliamentary election,” Derek Plumbly, the UN Special Coordinator for Lebanon, said in a statement issued today by his office. “The United Nations remains ready to support preparations for parliamentary elections in Lebanon at any time,” he added. According to media reports, the decision to extend the Parliament’s mandate divided the country’s two main political blocs, with those in favour citing both the deadlock over the presidency and the country’s security situation. For his part, the envoy said he met with the Speaker of the Lebanese Parliament, Nabih Berri, briefing him on the Secretary-General’s report on UN resolution 1701, which was issued today. UN resolution 1701 (2006) ended the fighting in Lebanon between Israel and Hizbollah. 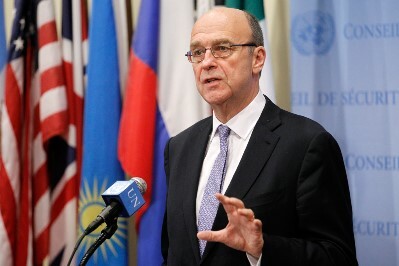 “The United Nations Secretary-General in his report again urges Lebanon’s leaders to show the sense of urgency and flexibility needed to open the way to the election of a President,” Mr. Plumbly said. Expressing hope that the Lebanese Parliament would elected a President without further delay, the envoy underscored that “its importance for Lebanon’s unity and the ability of the State to confront present challenges is obvious. “Hence its importance for all of us, the international community and the Lebanese people alike,” he added. The so-called Blue Line separates Lebanon and Israel. There has been a presidential vacuum in Lebanon after the term of Michel Sleiman came to an end on 25 May. UN officials and the Security Council have repeatedly urged the Lebanese Parliament to elect a new leader without delay. The country has also been dealing with renewed terrorist threats and a growing refugee population resulting from the conflict in neighbouring Syria.